Clinically apparent pulmonary toxicities are quite rare after radiation for breast cancer, and thus data regarding pulmonary toxicity from breast radiation is relatively limited and heterogeneous. The pulmonary toxicity profile includes the acute/subacute toxicity radiation pneumonitis (RP), as well as late toxicities of pulmonary fibrosis and secondary lung cancers. 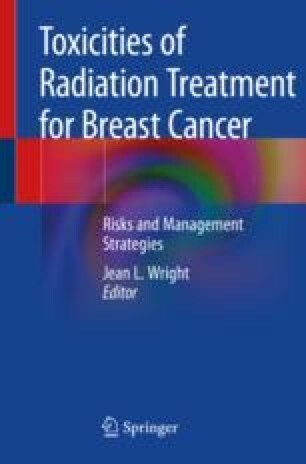 Here we review available data regarding the range of pulmonary toxicities observed after adjuvant breast radiation, as well as techniques for minimization.